In Ep. 20, Tim talks with Paul Rugarber of PDR Designs Architecture in Point Pleasant, NJ. They discuss what the process is like for a client working with PDR Designs, and how they like to help educate their clients so they can fully enjoy, and participate in, the process. They discuss Paul’s new book titled “Architecture to Construction (and Everything in Between)”, and how Paul truly enjoys giving back to the community and helping others. Enjoy! Tim Mullooly: Welcome back to Living with Money. This is Tim Mullooly. 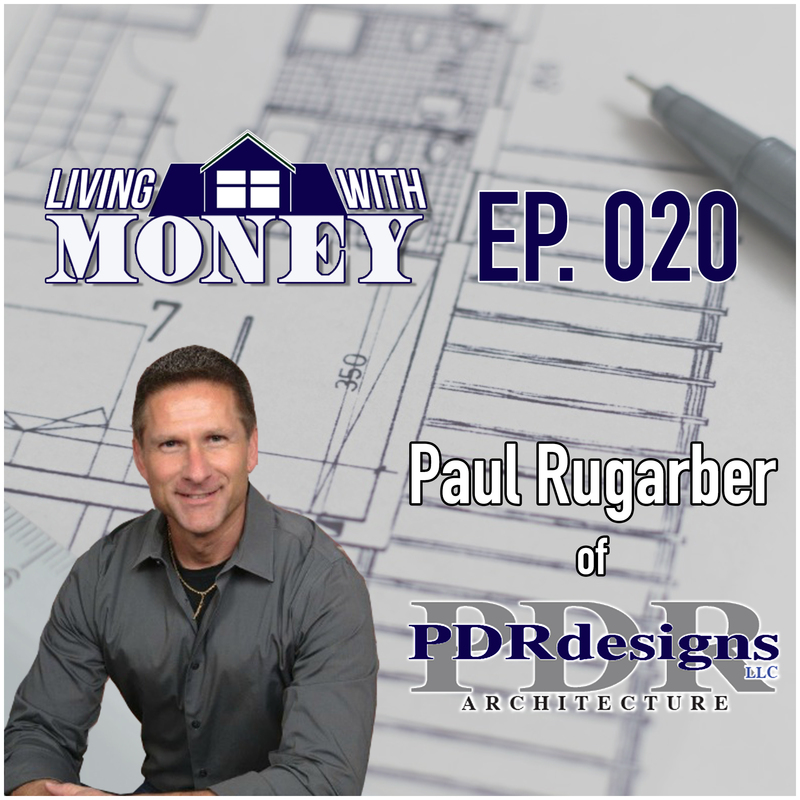 On today’s episode, I have Paul Rugarber from PDR Designs with me. Paul, thanks for coming on podcast. Paul Rugarber: Thank you very much for having me, Tim. Tim Mullooly: For the listeners out there, PDR Designs is an architectural firm. Can you give the listeners a brief background on yourself and your journey in life up until starting PDR Designs back in 2008? I went into that, actually started a company in college designing and building playhouses for Kids. I’ve always enjoyed having a business. It’s something I wanted to ultimately have. I got out of college and worked for a few smaller firms, did some design build with companies, finally built up a client base of my own in working on the side, so that I could open my own business, which was always my dream to do. Be able to be in control of my destiny. Whatever I want to do. Tim Mullooly: Right. So, it was kind of a culmination of pretty much everything in life up until that point working in construction and working for other firms and learning and getting clients together and then you were able to go out on your own? Paul Rugarber: Yeah, certainly. It’s great to be working for someone and have that steady paycheck. But then at the same time, working on the side in order to build up what your dream is and what you want to do. So, if you’re not doing ultimately what you want now, then how do you figure it out and make it work rather than just quitting and saying, “Okay, I don’t have any clients, but I’m going to make it work,” let’s start building up a client base while you’re doing something else. Tim Mullooly: Right. Exactly. You want to follow your dreams, but you want to do it smartly. You don’t want to jump out the boat like you’re saying, quit your job and not have anything to fall back on. So, smart move of building up the clients first and then being able to start the firm after having the clients. Paul Rugarber: That was a bit of a struggle because actually I started in 2008, which as we all know, economic times are not very good. But a lot of people say, “Hey, if you can make it through that, you can make it through anything.” That certainly teaches you to adapt and become different and see what is it that I need to do if I really want to make this work, what do I have to do? And being persistent enough to do that. Tim Mullooly: Right. Being in the architecture business, I’m sure that was pretty drastically affected by what happened in 2008 with the housing market and everything. Guessing it has rebounded nicely since then, though? Paul Rugarber: Yeah. Certainly, things have come back ways and where we are right now in the shore area here, there’s a lot of influx of people from New York certainly helps our economy locally here, so which maybe we’re not as affected as some of the other areas in the country are not as badly as they are. Certainly, you got to learn to do things a little bit differently in order to survive. Tim Mullooly: Speaking of influx, off the top of my head, Hurricane Sandy back in 2012, I’m sure that was an unfortunate time for a lot of people. But for an architect, someone looking to rebuild houses, that was probably a decent time for business, even in a tragic time for a lot of people, right? Tim Mullooly: What type of clients do you look for, and what type of clients fit best with PDR Designs? Is it mostly residential projects or commercial projects, a little bit of both? Paul Rugarber: We do mostly residential. I would say we’re a boutique architecture firm. We do most second homes for people. Vacation homes down the shore here. So, we do a lot of things for clients that are local and in addition, or something done, but the majority of our work is the custom residential homes, people that are far away. Whether they’re in Florida or whether they’re in New York, and they’re not on site all the time. So, we need to learn to be able to design and communicate with them well during that process, guide them through the construction process. We learned to work with that particular client. So, that’s really what our specialty is. At the same time, being good at that communication with clients, then we can branch out into other areas. We just did a pet resort up in ocean Township, the Greenleaf Pet Resort, which is a fabulous facility. A 36,000 square foot commercial pet resort. It’s like a five-star hotel. That one, it’s something that stemmed from our contact with other people and the residential things. So, we’ll do anything, take on any kind of job. But our special is the custom residential. Tim Mullooly: With people that are, like you were saying, not necessarily in town all the time doing projects with them, is it particularly difficult to communicate with them? With them potentially being halfway across the country and you’re trying to construct a house for them, is that a little challenging sometimes? Paul Rugarber: It certainly has its challenges. For the most part, people are available at their own schedule, right? So, if they were local, and we could sit down and go over drawings and things, it’d be a lot easier. But if they’re not, then you figure out, okay what do we need to do in order to convey our design ideas to them adequately through drawings, through calls with them, emails, whatever it is. Some clients are available much more frequently. And some clients are very infrequently available. So, you have to adapt to what their schedule is, figure out again, how to make that work. I like to think of architects as problem solvers, so this is my problem, how do I solve it? How do I figure it out, so that what I want to do, my design ideas are well put to them in a format that they can understand? Tim Mullooly: Right. I feel like being able to accommodate them not being directly there to speak with in person is a pretty rewarding quality for a firm to have, because that might set you apart from other firms who might not be able to properly convey their ideas to people that aren’t in the state. Is that what you find sometimes? Paul Rugarber: Yeah. Certainly, what I found in life is communication is everything. So, it’s what is someone’s expectations? What is it that you’re conveying to them and how so that they understand it? Some people don’t understand looking at drawings, so maybe we have to do a rendering or sketch for them that shows it differently. Maybe we have to show them a picture of a different example of something so that I can say, “Okay, I see in this what it is that you’re talking about.” So, learning what that form of communication is for the different people, and then being able to adapt to them so that you can adequately describe what it is. So that at the end, there’s no surprise. Like, “I didn’t think it was going to look this.” We don’t want that to happen. Tim Mullooly: Yeah, you want everyone to be on the same page? Tim Mullooly: Speaking of not necessarily understanding certain things, I’m not very well versed in architecture. I feel like commercial and residential projects might be very different. What are some of the big differences or similarities that you see between the two? Paul Rugarber: You’re correct. They are different animals. I enjoy the residential because it’s more personal. You’re really dealing with … To me, you’re building someone’s dreams and hopes and they’re going to raise their family in these houses and have memories, and that makes it really special and cool. But it also means that they’re very particular about the details and things they want in the house, because it’s so personal to them. Whereas you go into commercial, and it’s really people want to be able to have a rentable space or they want to open a business, right? And they want to be able to make money. Paul Rugarber: So, it’s certainly time is more stringent there, cost is more stringent there. But it’s just different. You can still do some cool projects and fun things. But they are two different worlds. Tim Mullooly: Regardless whether it’s commercial or residential. What’s the process like for a client when they come to work with your firm? On your website, you outline there’s a five-stage process for your clients, do you think you can briefly touch on that and what a client can expect? Paul Rugarber: As a boutique architectural firm, we like to pride ourselves in service and what we do and how to do things differently, and the level of service that we provide as well as the level of caring that we provide. I wrote a book. I’m going to go off topic a little bit. I wrote a book for the clients for this reason, because they came to me with all the same questions all the time. Is I haven’t done this before. I don’t know what’s supposed to happen. What am I supposed to do? What do I expect an architect to do? What do I expect a contractor to do? Who hires a contractor? All those things. Over the years, I started writing them down, because I was getting the same questions all the time. It made sense. I started putting it together and said, “I’m going to put a book together on this, so that I can give this to clients to educate them a little bit about what it is that we do, what happens during the process, what’s going to unfold so that they’re not as nervous about the process, and they don’t look at it and say, “Oh, my God, there’s so many variables. There’s so many unknowns.”” They’re apprehensive, and it’s not a fun way to begin something that really should be a fun process. We give them that in the beginning, and say, “Look, read through this, and so you understand what has to happen at the different times.” So in dealing with us, that’s our first impression with the clients or that’s their first impression of us is we can say the level of caring and we’ve done that we present them with this book to begin with. And so, we get into then talking about their project and what it is. What are really their needs? Some people may say they need something specific, but I really want to get a little bit more in depth with them so that I understand how they’re going to use the house or space, and what it is truly that would solve their problem. Because maybe it’s not the way they’re looking at it, maybe it’s something else. So, I’d like to understand that. With that, we get into the five stages of the architectural process. which first one is, on any project, if it’s doing a renovation, it would be documenting the existing conditions that are there. So, we have to measure up what’s there, look at surveys. So, we have an actual print of the house that we’ll create on the computer. From there, we need to do discovery and programming. Which is going to be looking at the zoning, looking at the code research to see what it is that we can do with the house in order to, if they want to bump out or go up or whatever. We want to make sure that code wise we can do that, zoning wise we can do that. And then we get into schematic design after we understand the constraints at a project. So, the schematic design is doing some freehand sketches that are going to show us where rooms are going to be located, and rough ideas of things, rough elevations. We work through that back and forth and that’s a nice quick, easy way to get our ideas out on paper for them to understand and go through a bunch of different options in a quick amount of time, so we can narrow it down. Yes, bedrooms going to be over here. We want the great room over on this side. We want roughly the size for a kitchen. And then from there, we can expand. The design development stage would be then taking those rough sketches, putting them into the computer, hard lining things, adjusting doors and windows and things like that. So that the full set of preliminary drawings, they look at it, they understand it, they approve it. And once they said, “Yes, that’s it.” Then we go into the construction document phase, which is the last phase. And that, all the notes details, everything that’s needed for the building department to be able to approve it, get a set of plans, and move on. And then the phase after that would be construction administration. So, if you need help with selecting contractors, with reviewing bids from contractors, we sit down, and we do all that with you. If you want us to be on site during the process, we can do that and take a look at things there and make sure that things are going well. Clients that aren’t down all the time, have a lot of trust in us. So, they’ll say, “Hey, let’s do that phase so that you can keep an eye on things, report back to us.” Certainly, they trust the builders, but they trust us a lot too. And so, want us involved in those phases. Tim Mullooly: I feel like through everything that you just described, it sounds like an extremely in-depth process. Over time, build that relationship with all the back and forth with the client that they build that level of trust with you. For me, I feel like if I were out of state, and I spent all this time talking with an architect, I would feel more comfortable if they were on site watching the builders follow out the plans that we so carefully spent so much time going over. Paul Rugarber: And so, I tell people that spending a lot of money in this might be the biggest investment some people are ever making in their life. So, if you’re going to spend that much money, make sure that you trust the people you’re working with. The trust and the relationship is more important than the bottom dollar cost of what it’s going to cost for architectural services or for the construction. Don’t just look at the bottom line because you get what you pay for in life. Make sure that you have that understanding and that trust in that relationship with someone. Because without that, then everything else is going to be a battle. So, you’re going to spend a lot of time with these people. Make sure you understand them, know them, you’ve met with them, you trust them, and you feel like it’s someone that you like. Tim Mullooly: This might be a hard question to answer. But through all of those meetings and stuff, is there usually like an average amount of time that you spend with a client per project, or does it really vary? Like are some people know exactly what they want in the first meeting, and then some people, it takes it a dozen meetings and hours and hours to get down to a final decision? Paul Rugarber: Yeah. It’s very client driven. Some clients are quick with decisions and they’re good with it and saying, “Hey, we know what we want, and we can go through the process quicker.” Other people may be unsure. They get a set of plans, and then go and talk to their neighbor and talk to her mom and talk to their friends and say, “Oh, they recommended maybe we try this. Maybe we try this. Maybe we try this.” You end up with change after change after change for it, to look at and explore all the different options. I tell people, that’s fine. It’s your house. I want to make sure it’s what you ultimately want. But there are clients that know what they want, and the process is quicker and easier. And then the ones that are a little bit more indecisive and then it takes a little bit longer. Tim Mullooly: You said the first thing you do is you give them this book to read through and kind of brush up on what to expect. Before you published this book, have you found that it’s easier to work with clients having them read that beforehand, versus before the book came out and they didn’t have the book to read? Have you found it beneficial for them to read that before getting started? Tim Mullooly: On your website, I saw that you have a handful of design partners listed. Can you talk about the benefits of having relationships with these partners, and how it helps the whole process work together when you have these partners to work with? Paul Rugarber: Similar when a general contractor, when you hire them, they’re going to use the same subcontractors that they use all the time because they have relationships with them. They know that when they call them, they’re going to be there to answer. If there’s a problem, they’re going to come and fix it. So, I like to do the same thing. There’s certain builders that I’ve worked with over the years that you find are the good guys in the area that know what they’re doing, and that they’re going to stand behind their work. So, I like to develop partnerships relationships with them. So, I’ve put some video interviews with them so that clients can get a feel for them. Rather than just saying a name of someone that go look at this person’s website, like here, watch this interview and get a feel for them a little bit more before you even meet them. So, there’s a face behind that. Tim Mullooly: Probably speeds the process along a little bit too when you have people to recommend to them. Tim Mullooly: They don’t have to go out and search for their own interior designer or someone. You have a handful of people that you can recommend to them. Tim Mullooly: Right. It’s nice for the clients to just come to you, kind of like a one stop shop. They come to you and then you can recommend all the other things that go into building a house. Touched on the book a little bit already the book is called Architecture And Construction: And Everything in Between. We’re going to link in the show notes to the website for PDR Designs, and also the page on Amazon, where you can go pick up a copy of the book as well. We touched on pretty much the main point of what the clients can get out of the book. Were there any other reasons why you decided to write this book on a on a personal level? Paul Rugarber: On a personal level, it’s enjoyable to do something. Let’s say it’s a big kind of goal, right? And so, in order to accomplish something like that, it feels good. Maybe a little difficult along the way. It’s something that when you’re done, you’re like, “Wow, okay, that’s cool. I wrote a book.” It’s something really neat, something different, something not everyone has done. Business wise, it’s something that I saw such a need for. And so, I looked at when you’re getting the same questions all the time and you see that just people are apprehensive, they’re not sure, they don’t know what’s going to go on. And as much as I sit and explain it to them, there’s too much information to… I’m sure the same in your industry. You can’t just tell someone all this stuff. They have to sit and read it and look at it and take it in on their own time. This was designed to help the clients you know. To ease their fears of what was going to go on, so that they understood it. And they said, “Okay, now I see what’s going on. I know the process. I’m not as scared about it. I can sit back and enjoy it.” It should be an enjoyable process, and I started seeing that it wasn’t for a lot of people. Tim Mullooly: Like you were saying, there is a lot of so much information throughout the entire process that’s probably nice for them to have a hard copy of something to refer back to. Because, like you were saying, you can talk to them and give them all this information but at some point, you kind of see people’s eyes glaze over. They can only take in so much information at one time. So, having the book is something good for them to look back to. Paul Rugarber: Right. I was with a client recently up in Colts Neck. She had gone through and highlighted all these different sections and turned down pages of the book and she’s like, “Look, I’m going through it and I have all this stuff and I’m putting down notes on things.” So, it’s good to see that people read through it and enjoy it and it makes them smile that they understand it a little bit better, and they know what’s going on. That’s what I enjoy. Tim Mullooly: Feel like it would make them more invested in the process as well, because they kind of understand it better. So, they’re not as in the dark or don’t understand what’s going on. They can actually participate in some of the conversations, and actually understand the topics. Paul Rugarber: Right. They know what to say, they’ve read about it, they know what’s going on next. And so, they know. A big thing is managing expectations, because we don’t know how long something’s going to take or what the steps are involved in it, you’re not sure what to expect. That’s where a lot of miscommunication comes in. But they know after this, comes this stage, or these are some of the issues that might come up during these phases. Okay. So, when it comes up, then they understand. All right, this isn’t abnormal. This stuff happens all the time. So, at least I understand what it is, how to deal with it, and how we’re going to move on next from it. So, they’re not don’t get all crazy every time something small comes up. Because in construction, something’s always coming up. Tim Mullooly: We say it here in finance, and I feel like it probably would apply to your industry as well. An educated client is the best type of client, for a number of different reasons. One being that someone who understands the process is more likely to be able to refer their friends or, if they know someone looking to build a house, they had such a great experience and they fully understand the process now. So, they’re more likely to refer business to you. Have you found that with having the book and getting people more involved in the process, has that kind of had a secondhand effect on referrals or marketing? Paul Rugarber: It’s hard to say. The book just came out in December. We’re only a few months into it now. So, as I said, it’s a good way to start a meeting and it’s good to be able to tell people that. But whether it’s caused more referrals right now, unsure, but I have to get back to you at the next podcast. Tim Mullooly: Yeah, definitely. We’ll do a follow up episode to see how the book went. Paul Rugarber: There we go. Tim Mullooly: Yeah. I also read on your website that you’re very active in the local community as well. Can you talk a little bit about the work that you do with Long Branch High School and the Habitat for Humanity? Paul Rugarber: Sure. With the Long Branch High School, I was in a project called Project Lead The Way, which is an advanced track of classes for people that think they want to do the architecture or engineering fields. And so, they’ll put them in specific classes from freshman year to senior year, so that they really get a good feel for what’s involved in all the different fields of engineering and for architecture and what the different aspects are. So, I went in and I would give a couple presentations with them a sat on a board there. I would help the kids to understand a little bit more about what’s involved in architecture, how we perform it. I’d look in at the projects that they’re working on and kind of critique some things. So, that was fun. And then with Habitat for Humanity. It’s something I’ve volunteered for in the past and worked with them in helping to build things, and now we’re doing some work with them as far as houses that they need done offering some design services for that. I like to give back to the community in whatever ways. I was on planning boards and different commissions with towns and the different Chambers of Commerce. Because it’s something that’s important to me is if you have knowledge, then you should share it with others. And so, I like to do that whenever I can and encourage others to do that as well. We’re in this world and trying to figure ways out and if we can help others along the way, then I think that’s a great thing, why we don’t all need to struggle the same if we’ve learned something, share it with other people to make it a little bit better. You know what? You’ll find a lot of enjoyment by doing that as well. It’s not just, oh, well, it’s going to help the other person, but it helps you. It gives you a good perspective on life. Tim Mullooly: For someone who is just getting started in the architecture field, maybe some students at the high school, what would you say is the most important thing that you could tell someone entering this type of business today? Paul Rugarber: Do something that you enjoy, and don’t worry so much about what it is that you’re choosing. May contradict each other a little bit, but I think some people are so stuck on having to choose the ultimate thing that you’re going to do for the next 60, 80 years of your life as we live longer. But it’s really, you can start in a field, and you can branch out and do different things. But the key is, with any project, just start doing something. So, pick something that you find enjoyable. Don’t do it because you’re chasing money. Do it because you enjoy it. If you find something and figure out how do I take that and how do I make it profitable? Or maybe I’m just really good at it. So I should do what I’m good at. And then, you can do the other activities later that are more enjoyable for you. But there’s a certain amount of you need to earn money doing something, right? Paul Rugarber: Figure out how you can do that and do something that you enjoy. Don’t look at it and say, “Well, this makes the most money. So, I’m going to go into that field.” Really, enjoy what you want. And with architecture specifically, I think you need to be curious. I said we’re problem solvers. So, you need to want to solve problems if and be curious about how could I do it in a different way? So, if doing it this one route isn’t working, then how else could it be solved? I think that’s true for any industry. I think the more curious you are, and the more problem solving oriented you are, then the more creative thinker you are, and the more fun you’re going to have at something in the better you’re going to become at it. If you take a problem, I like to put this to my staff or kids sometimes, if they’re looking at something and saying, “Oh, well, this can’t be done.” I say, “Okay. If I was going to pay you a million dollars to do it in the next month. Could it be done?” Oh, wow. That’s different. Tim Mullooly: When you put it that way, yeah. Paul Rugarber: So, it could be done. So, figure out a way to make it and get it done. So, look at a problem and say, take out different variables, put in different variables, whatever you have to do, say, “How could we accomplish this?” Maybe some things are impossible, but maybe it gets you to look at it differently so that you can find a different solution to something. And the same thing with kids and going to school. You’re doing something, and you say, “All right, maybe I don’t like this exactly the way it is. Maybe I could adapt it.” I have a lot of friends who went to architecture school and some became furniture designers and some taught CAD for other big firms. So, you can branch out and do all kinds of things just similar to any other field. But you got to pick something that you enjoy. If you find later you don’t enjoy it, you can switch and do something else. It doesn’t have to be 180-degree turn, but it can be a slight adjustment to get to where you want to be. Tim Mullooly: Right. Yeah, you’re not going to be able to find out what it is you actually want to do, unless you start doing something. And then along the way, like you’re saying, you can shift and change and find what it actually you want to do. Yeah. Maybe it’s not particularly there’s one thing, but maybe it’s a subset of that. Maybe it’s sales that you like, or maybe it’s not sales. Maybe it’s teaching people that you like. Find what that is, but you don’t know. Like you said, if you don’t take that first step and try to figure it out. Tim Mullooly: Along the lines of you said for architects need to be curious and be problem solvers. Over your career, how have those problems changed? Meaning, how has architecture shifted over the years? Because I’m sure you look at houses that go up today versus houses that went up 50 years ago, they don’t look the same. So, in your experience, how has the land changed a little bit? Paul Rugarber: Well, technology is always changing, which affects houses and everything that we do, because the materials are always changing. So, it’s something you need to keep up on of learning about the different things you always want to go back to. It’s neat to say, “Oh yeah, I’m trying out this great new product.” But at the same time, I don’t want to experiment on a client with a product I don’t know about. So, that’s a difficulty for, let’s say, product reps that come in and say, “Oh, yeah. Use this. It’s the latest and greatest.” Okay, it might do all that, but what if it doesn’t? Then I don’t want to be the one that recommended, and it doesn’t. As much as things have changed, there’s still certain elements that remain the same that you want to stick to the core of what you know works, so that you’re building a sound home. Obviously, the client wants some the best windows or the best wrap on the house or the best siding. So, you got to really always be learning about things so you know what is the latest technology that’s something good, that’s not just something that’s going to be around for six months, but that’s going to be out there for a long time. And talking to other people and looking at other projects where you see things occur. And then how do you integrate that into your house? Tim Mullooly: What would you say is the main thing that you want people to take away from the experience of working with PDR Designs? I wanted to be that, “Yes, I’m talking to them. I’m moving the project forward. I’m enjoying it. I want them to have that level of service, that level of no matter who they deal with in our company, that they know it’s going to be a pleasurable experience. It’s going to be fun, service oriented. But positivity is the biggest thing that I want them to take away. Tim Mullooly: Building a home for everyone should be one of the most exciting things that I personally I think that you do in your life, you know, you’re designing the home that you’re going to live in, you should definitely always enjoy that process. So, we’re going to wrap up with a couple questions here that we like to ask most of the guests that come on. First being, how would you define being wealthy? Paul Rugarber: Being wealthy to me would be having freedom. I believe money gives us freedom to do what we want. I don’t care necessarily how much money I have in the bank. I care what that gives me as far as it allows me to take a trip with my kids or allows me to take time off from work and do something because I don’t have to work 100 hours a week. So, if I want to, I can and that’s great. I set my own schedule. But at the same time, being wealthy gives me the freedom to do whatever I want to do. That may change from person to person. So, maybe my level of wealth is not the same as someone else’s. But I see it all as being disciplined in life to earn the money that you need to give yourself the freedoms that you want. I have four kids and I’m super involved in their lives and do lot of sports. I can take time off to go to their games or practices or coach them or do whatever it is that’s needed with that, that I want to do. Because I’m willing to disciplined in other areas of my life so that I can do that. To me, wealth gives you freedom in your life. Tim Mullooly: Right. Last question that we have for you. We’ve talked a lot about PDR Designs and architecture. Outside of work, though, what’s one thing in your life that you’re extremely passionate about? Paul Rugarber: I can’t say just one thing. Because the one thing that I’m really passionate about is helping other people. And so, I do that in a number of ways. I like to spread the information that I know. I facilitate a group of architects from around the country. We meet every two weeks, we do a video call and I help them with business. It’s through a company called EnterArchitect, which friend of mine from college started this company. And so, it works with all different architects that are small to mid-sized firms that struggle with business and want to get better. I’m one of the facilitators that go in and coach them and help them. We have this mastermind session to how do you guys get better? What are you doing? What can I give you advice on? How can I get you better? I enjoy doing that because it helps them, right? And passing on the things that you know. Another thing I do is I started a group of local builders. We sit down once a month and we go over the same thing. It’s local people, but they’re willing to share what it is that they know with each other, and say, “Hey, how do you do this? And how do you do this? And what product do you like here? And what issues have you run into?” So, I facilitate that group. We meet in my office. Sometimes we’ll bring in sales people or business coaches or whoever, whatever topics may interest everyone. The only reason I do that is to help them with their businesses, because I want to share some of the information that I’ve learned. We were named, our firm, the AIA Jersey Shore Firm of the Year for 2017, which makes me super proud that we’re being recognized for what we do. Part of that is community involvement in the way we’ve shared our knowledge with other people. So, it’s something I continue to do. I also put out Facebook and LinkedIn videos on YouTube. That’s just motivational stuff that I like. And again, I believe passionately that we’re all capable of doing so much more than we believe we are. I try to spread that word to get people to understand that you can do so much more with your life. It’s just a matter of being a little bit more disciplined in some areas. But to me, that discipline gives us freedom in other areas. I like to share that message with people to try to help them, lift them up, motivate them, get them excited about the possibilities. Paul Rugarber: I also started a company years ago called Speak With The Cleat. I would go and talk to schools and talk to kids and just try to motivate them about sportsmanship and leadership and that kind of thing. So, even a few weeks ago, Jackson Liberty high school called me, and they had a big game against Jackson Memorial on Lacrosse. So, they brought me in to talk to the kids the day before the game, so that we could get them fired up a little bit. So, I enjoy doing things like that and sharing whatever it is that I know. How can I help someone else to be better and be a better person, and then how can I get to be a better person as well. Tim Mullooly: That’s awesome. So many people today are very involved in themselves and trying to you know, just focus on them. So, hearing someone wanting to give back and you know motivate others is really great. If you’re listening to this on iTunes, please subscribe to the podcast to get new episodes every week. Feel free to leave us a review or comment, because it would really mean a lot to us. Be sure to follow us on Twitter and Instagram @lwm_podcast for more news and updates about the show. That’s going to wrap up this episode. We’re going to link in the show notes, like I said, to PDR Designs website. Also, going to link to their Amazon page where you can find the book, Architecture And Construction: And Everything in Between. If you’re looking to have a home built and you need an architect, give Paul a call. He will definitely help you out and make the process as easy as possible. Paul, thanks for coming on the podcast. I really enjoyed talking to you. Paul Rugarber: All right, Tim. Thank you very much. I appreciate the opportunity. Tim Mullooly: Alright. That’s going to do it for this episode. Thanks for listening, and we’ll see on the next one.